If you travel internationally, you need to update your United States passport every 10 years — and this means getting a new picture taken. If you hate going to those little passport-photo places and want to have more control over what you look like on your official government documentation, you can take your own pictures with a digital camera (at least here in the US, anyway; check with your local government if you live elsewhere). While you can take your own photo, but not just any snapshot will do. The State Department has the official passport rules and guidelines on its site, as well as a photographer’s guide and a photo composition template. Hand-held cellphone selfies are not allowed. The government wants professional quality pictures here. Take the picture in front of a plain white or off-white background. Make sure the photo presents the full head from the top of the hair to the bottom of the chin. You need to present a full-face view, facing the camera, without hats, sunglasses or other things that cover your head and face. If you normally wear eyeglasses, you can wear them, but you have to make sure there’s no glare in in the picture. Use a neutral expression — no goofy faces or wacky grins — and be looking straight at the camera. Facial-recognition software likes neutral expressions. Also, you are not allowed to use image-editing programs to “digitally enhance or alter your appearance in any way.” That means no overdone beauty-magazine cover retouching, zit removal or wrinkle smoothing. Just touch yourself up beforehand and take another photo. The final photograph needs to be two inches tall by two inches wide — and you need to have two copies of the image. You also need to have your head centered within that space the height of the head and the eyes within a certain measurement within those two inches of photo. Full details are on the State Department Web site. 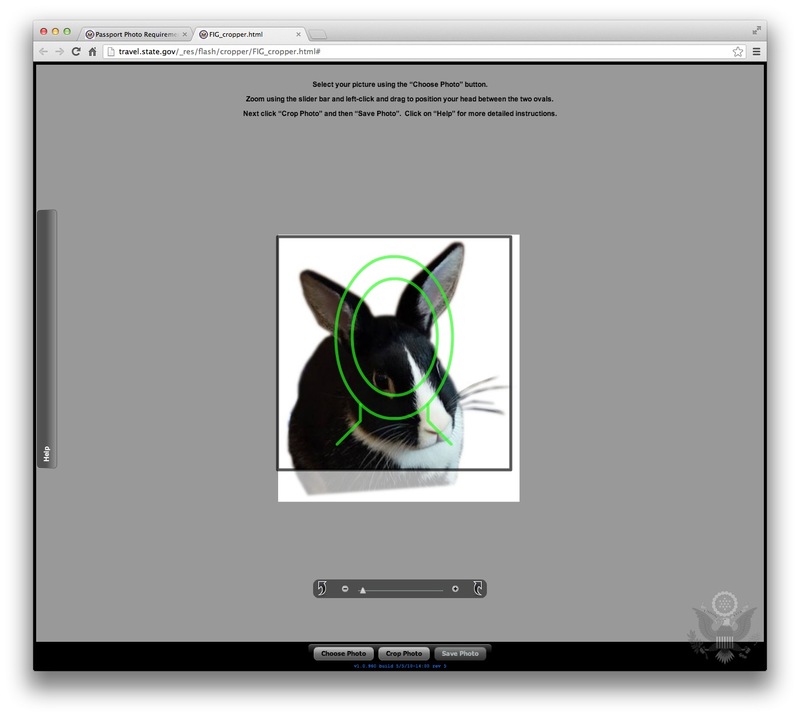 The site even has a free photo tool (shown below) that lets you prepare an existing photo on the computer for use with a passport. You basically start up the Flash-based app and select a photo stored on your computer. You can resize and rotate it if needed and crop it to 600 by 600 pixels. There’s a template on the page that helps you get the head size and proportions correct. Once you get the picture sized and cropped, you save it, print it and send it in with your passport application. The inclusion of the digital photograph enables biometric comparison, through the use of facial recognition technology, at international borders. The U.S. e-passport also has a new look, incorporating additional anti-fraud and security features. Curious about those electronic chips and records? Read up on the official US Electronic Passport FAQ. And then have a lovely trip overseas with your personally approved passport photo, the one you won’t be ashamed to show off at the border or customs counter.